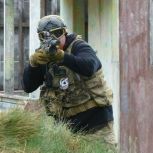 April 2019 - Airsoft Sports New Zealand inc.
3-ZERO Airsoft's - Broken Home events are a Private Military Contractor (PMC) themed event working around four individual teams all competing for “contracts” (or missions). Depending on your contract, sometimes you will work with other teams, sometimes you will be in direct opposition, and other times you will be indifferent. So you never really know who you can trust. Your team will be given a new contract to complete every couple of hours. It is then up to your team to decide how to best complete the objectives. Your team will be awarded points based on how well you complete the objectives set in the contract. Points are usually based on about 500 points for a fully completed contract, 300 points for a partially complete and no points for failed or not satisfactory completed. In addition to contracts there are strategic points or resource points throughout the field. Controlling a point will award your team the specific resource associated with that point which can be used in later missions such as medic, resupply, sabotage, or engineer. There will also be sub-missions and hidden missions depending on how you react to certain situations or Intel you collect. Each team also has a communications tower they have to keep operational. The event is designed to encourage team work and push you to the limit as a team. A force on force skirmish with rolling fire fights. Pick your fights and play smart. This is a semi only event and there is an ammo cap that each player can carry in the field at any one time. One full auto support weapon per squad is allowed. Seaview is a coastal town located in what is now known as the contested zone in the nation of Hokistan. Hokistan gained autonomy after the dissolution of the USSR in 1991 but remained firmly under Russian influence. As the global resource crisis peaked in the second decade of the 21st century previously untapped oil reserves became hotly contested. Rusoil initially gained exclusive rights to once looked over reserves of Hokistan. In 2015 an American backed insurgency managed to destabilise the largest oil producing region “Seaview” to the point that the Hokistani government lost control and the UN was forced to intervene and enforce a ceasefire. A de jure Government for the autonomous zone granted Excelsior exclusive access to its oil rights. The UN is obliged to respect both corporations’ interests under the TGP Agreement. Rusoil and Excelsior have both employed private security companies to secure their interests in Seaview. Employees of G4D or RSS Group are charged with securing Pipeline Monitoring Stations to ensure continued flow of crude oil to their respective employer’s reservoirs. As part of this they are expected to secure the surrounding area and hinder their opposition’s ability to operate whenever possible. Each PMC will be paid via wire transfer for each barrel successfully delivered and a bonus may be paid for any subsequent actions required by the employer. Due to the UN enforced ceasefire delivery of small arms, munitions and other logistics is unable to be maintained through the client’s logistics operations. All PMC are to source logistics locally after deployment into the contested zone. Medical support will be provided by the teams own resources. - Players will have the option to play in squads of five with G4D (US/UK/Commonwealth uniform) or RSS Group (RU/EU uniform). - Commanders will be handpicked by the event staff. - Commanders will be responsible for commanding their team, meeting objectives and maintaining the logistics for their team to win. - There will be no bases, teams will sleep and eat (if they can) in the buildings they can hold.